2014-DSL 348/433/400 in 115 at bats. He only hit 6 extra base hits, all doubles. He stole 10 of 15 bases attempted. He had 16 walks and 9 strike outs. 2015-GCL 309/377/391 in 207 at bats. Again no home runs but 15 doubles and a triple. He stole 8 of 16 attempted. He had 19 walks and 10 strike outs. 2016-A- 347/386/444 in 475 at bats. He finally starte hitting home runs (3) adding 31 doubles and 3 triples. He only attempted 6 stolen bases and was caught 3 times. 2017-A+ Arraez tore his ACL after his 13th at bat trying to leg out a single April 9th. He was put on the DL on the 10th and on the 20th it was announced that he was done for the season. Arraez can hit and put together REALLY good at bats but he has not displayed power. As a second baseman, traditionally that is enough but with the league as it is today, that might not be enough. Arraez is expected to go back to Fort Myers and hopefully have a healthy comeback year. Arraez is still listed on the Fort Myers Roster on his MiLB page but is not on the News Release of the opening day roster. Best bet is that he is still recovering from the torn ACL suffered last season. Hopefully, he can be activated sooner than later. IF anyone knows his progress in the recovery, an update would be appreciated. I asked Seth about him yesterday, as I wanted to update the OP to this thread. Seth said he was still listed on the DL, but I didn't ask anything further as to the timing of it. Real sleeper of a prospect - hope he becomes more than the last 2nd base prospect for the Twins out of Venezuela, Luis Rivas. Not a bad player actually, just not special. Still, played for the Twins age 20-25. Pretty amazing he held his own. Never hit below .250. Sorry, not trying to hijack - Arraez has won MiLB batting championships. Hope he comes back from surgery with a vengeance. Seth reports Arraez is returning to action tonight!! #MNTwins 2B prospect Luis Arraez (@Arraez_21) expects to be activated and play for the Ft. Myers Miracle tomorrow. It was just over a year ago that he hurt his knee and needed surgery. " Well I have sucked as the AAP for Arraez this year. My apologies. Arraez returned April 19th and then hit .320 in 228 at bats for Fort Myers. He only has one homer on the year but he also only has 4 in his 5 year career. He did have e triples and 14 doubles. With a .794 OPS, he was promoted to Chattanooga on the 4th of July. He has hit merely .225 with a .505 OPS since the promotion but 58 innings is an sss especially right after a promotion. I’m not worried. Arraez will make the majors some day because of his batting average and defense. Defensively he has had the bulk of his time at 2b. In FM he logged 339 innings at 2b, 42 at SS and 49 at 3b. So far in AA he has 55, 26, and 33 innings respectively. With all those innings he only has 3 errors on the year. At second he has only 2 errors, both in FM and he has only one error at SS in AA. Who knows, maybe he’s the next Brian Dozier and he’s saving the power for the majors?! At age 21, he is still young for his level (AA) and he missed an entire year. Could be a call up some point next year. Looking forward to seeing him progress. And we may need a middle infielder who can get on base next year. I’m afraid Dozier and Escobar may both be gone in the next two weeks. Gordon surely will fill one spot but who gets the other? Probably not Arraez this year but he may get a taste of the majors this year and battle for a roster spot next Spring. 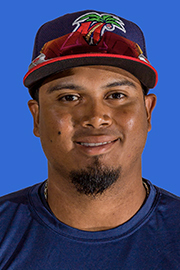 Arraez finished the year with 195 at bats in Chattanooga and 258 for Fort Myers. He hit A+pitching at a .320/.373/.421 Clip to start the year for a .794 OPS. He hit AA pitching to the tune of .298/.345/.365 for a .711 OPS. Combined he slugged 3 homers, 3 Triples and 20 doubles. He struck out 44 times on the year while inducing 32 free passes. He was caught stealing 3 out of 7 attempts...needs some work there. Defensively, he played 2B, 3B, SS, and LF but the vast majority of that time was spent at second. He commited 2 errors at SS (118 Chances), 2 at 2B (295 Chances) and 2 in LF (4 Chances). Maybe we should keep him in the infield. He did not have any errors at 3B (43 Chances). I believe Arraez is ready to step up to Rochester. With a good showing in Spring Training, it is possible he makes his debut first half season next year. Edited by goulik, 20 September 2018 - 11:26 AM. I'm starting to like guys who don't strikeout very much. It's much more interesting baseball. If you want to admire long drives disappearing into the sunset, go to the driving range and launch a few. But I think its more fun aiming for the markers and obstacles, not to mention the moving target of the ball retrieval guy, hehe. The triple is the most exciting hit; everybody is moving around somewhere. Move some fences back, deaden the ball a little bit, bring more excitement to the game. Arraez and Astudillo. maybe we just need more guys whose last name begins with "A"?